By now, you’ve likely heard about kale and all of the health benefits this dark green veggie has to offer. Now there’s a tasty way to add the vitamin power of kale to your dog’s diet with a delicious treat he or she really will love! Dogs Love Kale All Natural Wheat Free Dog Treats contain only a few, wholesome ingredients featuring kale for veggie nutrition that’s hard to find in other treats. What’s so special about kale? Kale has many health benefits for people and pets, a few of which may be surprising. Because it contains a high level of Vitamin K, kale helps protect against certain cancers and promotes bone health and proper blood clotting. It also is a great source of Vitamin A, which supports skin health and vision, and may help to prevent oral cavity cancer. For even more of a vision boost, kale contains lutein and zeaxanthin that protect against cataracts and macular degeneration. The high Vitamin C content in kale helps bolster immune system function, promotes healthy hydration, and supports metabolism, too. Being that it’s low in calories and high in fiber with no fat, kale makes an excellent, tummy-filling treat that promotes healthy digestion and bowel function. That’s not all! Kale contains alpha-linoleic acid (ALA), which is converted into the omega-3 fatty acids docosahexaenoic acid (DHA) and eicosapentaenoic acid (EPA) that boost brain function, skin and coat health, and reduce the risk of cardiovascular disease. ALA also may help protect against arthritis, asthma, and autoimmune diseases. Additionally, the phytonutrients in kale detoxify the liver and may even fight depression and cancer. Kale may also help lower cholesterol levels. Still not convinced that kale is an amazingly healthy food? Then, this may be the biggest surprise of all. Kale actually has more calcium than milk (per calorie), which helps prevent bone loss and osteoporosis. Kale also contains more iron than beef! Iron is used by the body to form hemoglobin and enzymes to transport oxygen throughout the body. Iron also assists in proper liver function and cell growth. Some dogs can easily be fed vegetables like kale, while others may need a little more encouragement. Kale can be sautéed in a little butter or simmered in chicken or beef broth to make it more appealing. You may also try finely chopping your kale and mixing it with your dog’s favorite canned food. Of course, because kale is so rich in the vitamins and nutrients mentioned above, a little goes a long way. Think of kale as more of a garnish than a main dish for your dog. Dogs Love Kale All Natural Wheat Free Dog Treats are packed with tasty nutrition! Dogs Love Kale All Natural Wheat Free Dog Treats are an easy and delicious way to give your dog all the benefits of kale without all the prep work. Packed with vitamins, minerals, fiber, and phytonutrients, these low-calorie treats compliment your dog’s regular diet without adding extra fat. Because they’re made with wholesome, limited ingredients and contain no wheat, Dogs Love Kale All Natural Wheat Free Dog Treats are great for dogs with allergies and those prone to weight gain. Each treat has less than 11 calories, so they’re a great way to reward your pet without having to downsize regular food portions. 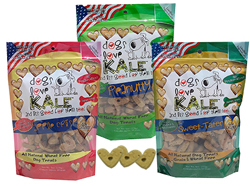 The kale in Dogs Love Kale All Natural Wheat Free Dog Treats is 100% USA-sourced. This delicious, dark green veggie is referred to as a “superfood” for its potent nutrient profile, including Vitamins A, B, C and K. Kale also provides vegetable protein, fiber to promote healthy digestion, iron, calcium, ALA, and phytonutrients. The next time you want to surprise your dog with a delicious treat, grab a bag of Dogs Love Kale All Natural Wheat Free Dog Treats, available in Peanutty, Apple Crisp, and Sweet Tater recipes. 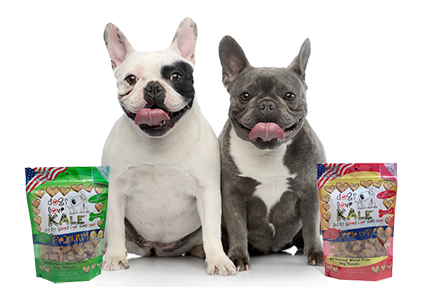 Win FREE Dogs Love Kale All Natural Wheat Free Dog Treats! Would your dog love some Dogs Love Kale All Natural Wheat Free Dog Treats? Just leave a comment below telling us why you and your pet need FREE Dogs Love Kale All Natural Wheat Free Dog Treats from 1800PetMeds! Three (3) winners will be chosen at random on Wednesday, October 4, 2017, so everyone who participates has a chance to win! (Limited to residents of the U.S.) Good luck! Congrats to the drawing winners: Dawn P, Rita A, and Jennifer A. We’ll send you an email about claiming your prize! Macy is just a PUPPY so she needs to learn to try new things! Sylvia is an old dog time to teach her some new tricks!!! My Sadie and Zeller would love to try these Dogs Love Kale All Natural Wheat Free Dog Treats from 1800PetMeds! Trying to find good-for-you snacks that they’ll eat has not been so easy. These would be great for them to try! I have 2 dachshunds that need to lose weight and these sound like a nutritious snack for them that they would love to try. We like to include our pets in everything we do. My husband and I love kale, and our two hairless guinea pigs, Kate and Molly, just can’t get enough! It is only right that our pitbull, Blade, and our Olde English Bulldogge, Darla, get in on the health benefits as well! As you can tell by what I buy, I want the best for my pup and have him around as long as I can and stay HEALTHY!